↑ "Mortuary temple of Ramesses II at Abydos". สืบค้นเมื่อ 2008-10-28. ↑ 2.0 2.1 Anneke Bart. "Temples of Ramesses II". สืบค้นเมื่อ 2008-04-23. ↑ "Rameses". Webster's New World College Dictionary. Wiley Publishing. 2004. 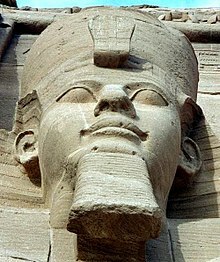 ↑ "Ramses". Webster's New World College Dictionary. Wiley Publishing. 2004. ↑ O'Connor & Cline (1998), p. 16. ↑ Rice (1999), p. 165. ↑ von Beckerath (1997), pp. 108, 190. ↑ Brand (2000), pp. 302–05. ↑ Christian Leblanc. "Gerard". Archived from the original on 2007-12-04. สืบค้นเมื่อ 2008-04-23. ↑ Rice (1999), p. 166.